There are hundreds of kinds of bread, but we're sure you will love blueberry popover. This truly American bread is great for breakfast. Celebrate National Blueberry Popover Day on March 10. Popover is a quickbread. 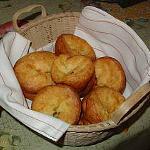 It is baked in a small pans, that are different from muffin tins. Popover pans are small, tall and separated from one another, that allows heat circulate evenly. Popovers are made of egg batter, similar to Yorkshire pudding, but slightly Americanized. The first mention of popovers dates to 1850 and it was found in a letter. The first printed recipe appeared in Practical Cooking by M.N. Henderson in 1876. Blueberry popovers are great for breakfast. Make a popover batter and fill each cup with it. Put some blueberries atop and sprinkle with sugar. Serve popovers only hot, because there is nothing sadder than deflated popover. By the way, popovers become rubbery if they are cold. So don't waste time and bake blueberry popovers for breakfast to celebrate today's holiday with your family.